I have been going back and forth between wanting to purchase a D-SLR handbag or just a camera insert to use with my existing bags. The main problem is finding a style of camera bag that I love. I would have to buy one that I would like to use for years. I do not have a good track record of sticking with handbags for much more than 6 months. 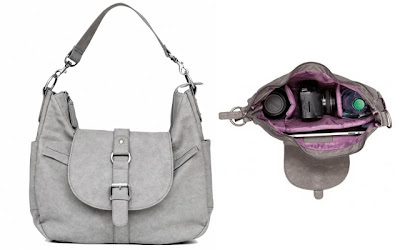 This grey Kelly Moore B-Hobo Shoulder Style Camera Bag did catch my eye though. It comes in lots of fun colors, but I think I would need a color like grey for me to not grow tired of the bag too quickly. This bag is selling on Amazon right now for $144.00 (regularly $169.00) with Free Shipping! What do you think? Do you use a camera bag disguised as a handbag or do you use a camera bag insert in your roomier purses?